The Helicobacter pylori (Hp) type IV secretion system (T4SS) forms needle-like pili, whose binding to the integrin-b1 receptor results in injection of the CagA oncoprotein. However, the apical surface of epithelial cells is exposed to Hp, whereas integrins are basolateral receptors. Hence, the mechanism of CagA delivery into polarized gastric epithelial cells remains enigmatic. Here, we demonstrate that T4SS pilus formation during infection of polarized cells occurs predominantly at basolateral membranes, and not at apical sites. Hp accomplishes this by secreting another bacterial protein, the serine protease HtrA, which opens cell-to-cell junctions through cleaving epithelial junctional proteins including occludin, claudin-8, and E-cadherin. Using a genetic system expressing a peptide inhibitor, we demonstrate that HtrA activity is necessary for paracellular transmigration of Hp across polarized cell monolayers to reach basolateral membranes and inject CagA. The contribution of this unique signaling cascade to Hp pathogenesis is discussed. 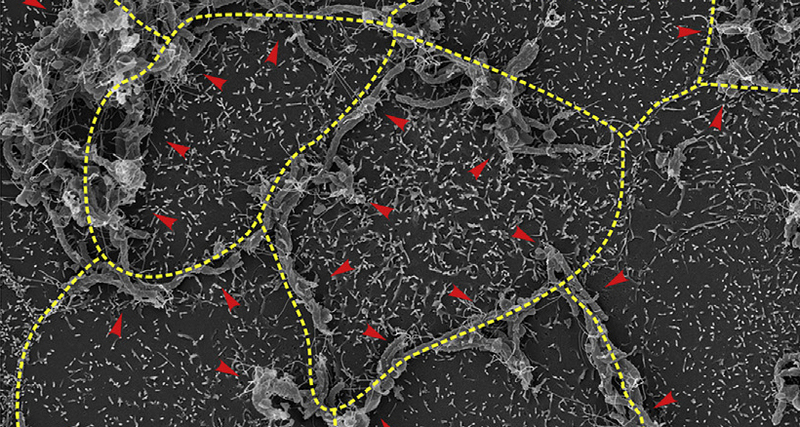 H pylori (red arrowheads) binding at the cell-to-cell junctions of epithelial cells.